Proper filtration is mandatory for the successful operation of plating processes. Palm specializes in providing all types of filtration equipment and media for the plating industry, from bag filters and cartridges to the various lines of disc filter systems and paper media. Bag filters provide a simple way to eliminate particulate and other contaminants from plating solutions. They are especially suitable for electroless nickel baths. Palm's bag filters are carefully made from the highest quality woven polypropylene felt, and are carefully sized for particle removal. Their support ring is made only of Type 304 stainless steel to ensure against bath contamination. Palm supplies a complete range of bags for most applications, and stocks the most commonly used P-1S (7 inch diameter by 17 inch long) and P-3S (4 inch by 8 inch) sizes. P-1S bags are available in case quantities of 70, while the P-3S size is packaged in cases of 100. Extra long P-2S bags are also stocked for applications requiring additional filtration, and are supplied in cases of 50 bags. Palm also fabricates holders for these bags which are sturdy and easy to use. They include a unique `slide lock' design, with no fittings to unscrew when changing a bag, and are totally constructed of polypropylene and Type 304 stainless steel. ENbag `slide lock' holders are available from stock. Disk filtration systems offer many advantages for filtering plating baths. Because of their large surface area and open flow paths, high volumes of solutions can be treated rapidly. 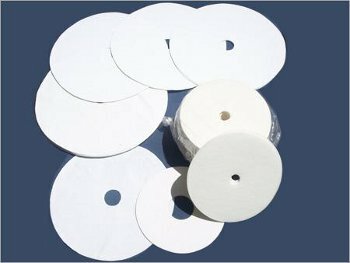 Their paper or cloth filters are also especially easy to change, and are the most economic media available. They also take up less volume and thus disposal costs of spent papers is usually less than that of other media. addition, the filters may be precoated with filter aid or activated carbon to increase their retention and to provide organic removal. Palm's filter papers are especially chosen for a combination of flow rate, wet strength and retention. They are carefully made from selected wood and cotton fibers. Palm stocks papers for most applications and for most popular chamber diameters. A common method of filtering plating solutions or other streams is through cartridges made of wound yarn or film. These cartridges may be contained in single housings or in large multiple element chambers. Depth filters offer dependability, ease of use and long life at a economic cost. In addition, they provide high dirt holding capacity with extremely low media migration, and are the most space effective method of filtration for plating services. Palm's filter cartridges are state-of-the-art, and are produced using a continuous winding process. Single, double and even triple length filters are produced as one piece. They are never overwrapped or glued together to obtain multiple lengths. Thus, there is never a chance of by-passing and poor filtration. Palm supplies tubes in a wide range of filter media, with retentions from 0.5 to 50 microns and lengths from 10 to 30 inches. The nominal diameter of all cartridge tubes is 2-1/2 inches. 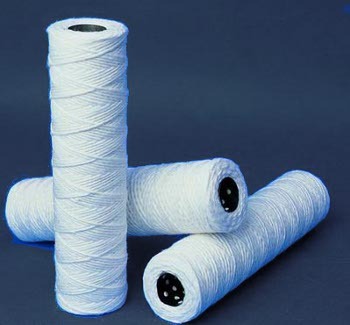 Polypropylene yarn offers the best all around media for most applications. It is completely resistant to most plating environments, including acids, alkalies, waters and some solvents, and is suitable for use at temperatures up to 200ï‚°F. For applications where leaching or fiber migration is a concern, fibrillated polypropylene is preferred. This type of filter is made from slit film and is free of the sizing agents used in the manufacture of yarns. Fibrillated filters, however, provide less dirt holding capacity than yarn, have less uniform retentions, and are suitable for use only to 150ï‚°F. Natural cotton is the most economic media for many environments. It is resistant to waters, oils, paints, some alkalies, and is preferred for solvents and other organics. With the proper core, it may be used at temperatures as high as 300ï‚°F. Type CC cartridges combine a granular carbon layer between a wound core and 5 micron retention sheath, allowing a solution to be carbon treated during filtration. They are interchangeable with standard cartridges. Please Contact Us with your filtration requirements.